I remember being slightly disappointed when I first arrived in Japan and thinking “Huh, you mean Japanese people don’t eat sushi every day?” Of course I realised after that it would be the same as thinking British people only ever eat fish and chips and scones every day! Despite sushi being one of my main reasons for being interested in Japan, it took another week or two after arriving before I even had a chance to eat some. The reason was because Japanese cuisine is so much more than just raw fish… there is a huge variety of amazing Japanese food, including some of the world’s most super gourmet foods. Continuing on from our Top 5: Weirdest Japanese Food, follow Japan Centre as we check out our Top 5: Super Gourmet Japanese Food. Tuna is big business in Japan. It is one of the most well known and popular toppings for sushi and generally referred to as ‘maguro’ in Japanese. Maguro comes in different grades, depending on where the meat of the fish is taken from. 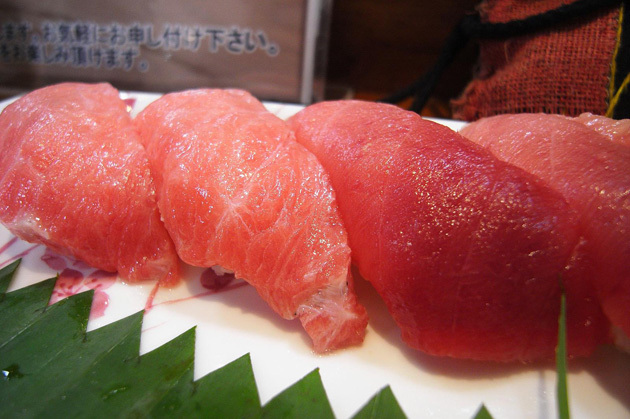 The very highest grade is called Otoro and is cut from the belly of the tuna where the meat is much more fatty. However, it is not the same type of fat found in meat like beef and pork, but is much smoother and gives the tuna a very soft, silky texture and rich, almost buttery taste. The colour is a light pink with white marbling or a striped appearance, so you always know when you have a quality cut of tuna. Otoro starts getting expensive though with a single serving priced significantly higher than normal maguro tuna. Did you know that the most expensive tuna ever sold was at Tsukiji fish market in Tokyo at the beginning of 2012 which reached a whopping £470,000! Mushrooms are a common sight on a Japanese dinner table as they have a rich, umami taste which matches Japanese cuisine perfectly. If you consider the number of mushrooms with Japanese names that we are familiar with – shiitake, shimeji, enoki and of course matsutake – it’s clear that Japanese mushrooms are famous worldwide. Matsutake are the king of Japanese mushrooms and come at a price that only a king can afford too! They are a huge, meaty variety of mushroom that have a unique taste and a firm texture. 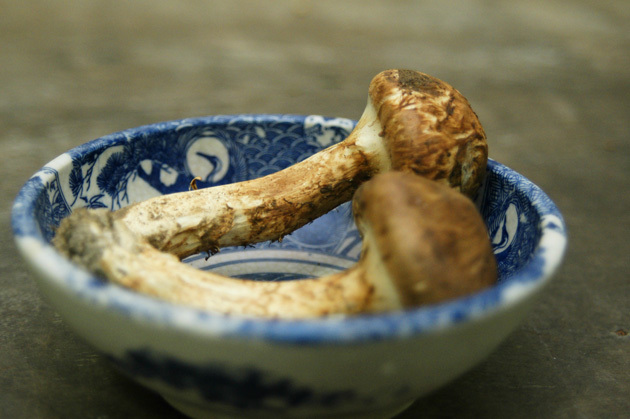 Prices of matsutake can reach up to £1275 per kilo for the fresh ones picked at the beginning of the season! Japanese people love melon! It’s common to see in Japan melon flavoured everything, from candy to liqueurs and plenty of tasty things in between. Even melon bread, which is named after the texture of the bread rather than the actual flavour of it, owes its name to the popularity of melon. One Japanese watermelon grower was getting frustrated with his watermelons rolling around all over the place and being impossible to stack efficiently. So he decided to grow his watermelons inside a glass box which forced it to grow into a square shape. 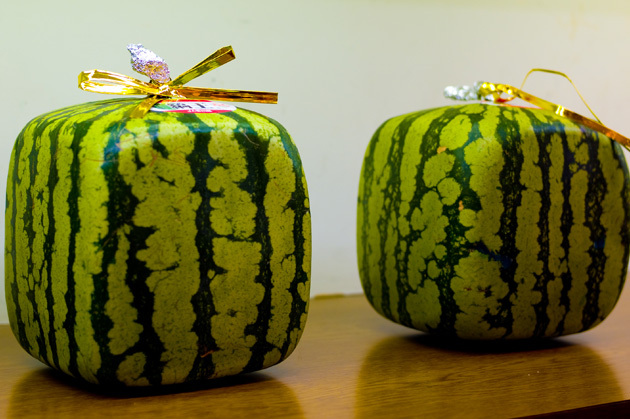 These amazing watermelons are (of course) more expensive than their round brethren, going for up to £60 each in Japanese stores. 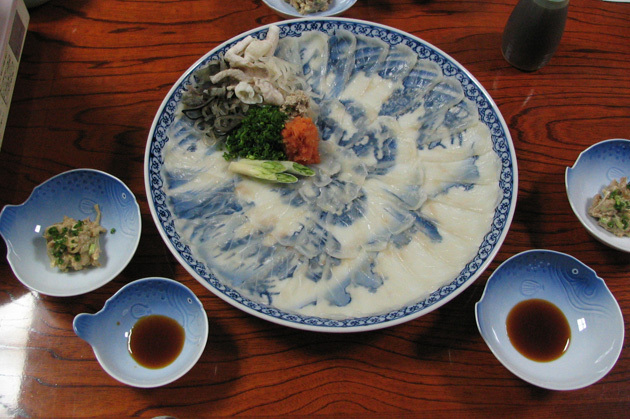 Everyone has heard about fugu, one of the deadliest dishes in the world. Pufferfish contains a deadly poison called tetrodotoxin which causes muscle paralysis and death from asphyxiation, even if just a small amount is ingested. However, this doesn’t stop Japanese people (and even myself), from enjoying it, provided that it has been carefully prepared of course. In order to serve fugu, a chef must train for years to be able to prepare it properly without contaminating any of the fish with the poison. The best chefs can actually even leave a tiny amount of poison on the fish which numbs the tongue and gives a sense of inebriation. I guess the appeal comes from the idea of dancing with death himself! There is only one item that can top the list of super gourmet Japanese food, and that is wagyu beef. 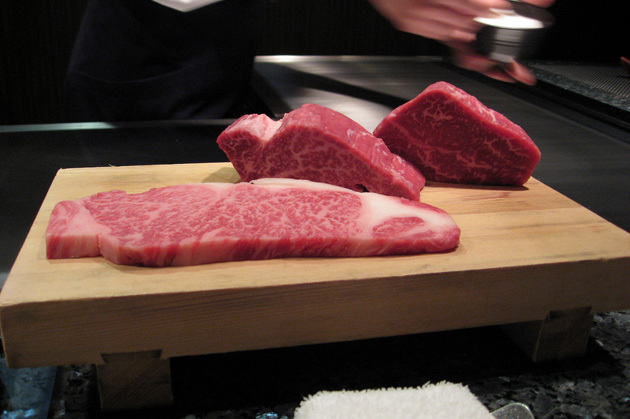 Often referred to as Kobe beef due to much of the high quality beef coming from a breed of cattle from the Kobe area. These are some lucky cows too, forget free range, they get fed beer, the best cattle feed and even get massages to help keep the meat tender and delicious! Benefits of wagyu beef include a richer taste from the marbled layers of fat, a higher concentration of omega-3 and omega-6 fatty acids and a better ratio of monosaturated to saturated fats. Good cuts of wagyu beef often fetch up to over £30 per 150 grams proving that these cows are neither cheap in life nor death. So there you have it! What Japan Centre deems to be the Top 5 Super Gourmet Japanese Foods. Since these foods are really hard to find here, I guess you’re going to have to use it as an excuse to go all the way to Japan! Although if that’s off the cards don’t fret! We may not be able to offer you a pampered cow or death on a plate, but Japan Centre often sells things with matsutake mushroom in and all of the meat and fish we do sell is of the finest quality. So who knows, if you keep tabs on our Japan Centre and Toku websites one day we might be able to offer you all the wagyu and fugu you can eat without the bank-bursting air fare! If you’ve been lucky enough to try some of these fancy dishes before, or have tasted something super gourmet that we haven’t listed here, let us know (and be immensely jealous) in the comments! Posted in Food and tagged Top 5, Wagyu. Bookmark the permalink. Great info once again Japan Centre! What a shame all of this food looks soooo tasty, my bank balance!! !